Lake Michigan bird carcasses make waves in botulism research. LANSING — Using satellites to follow dead birds drifting on Lake Michigan may hold the key to locating the source of the elusive botulinum toxin, which causes paralysis and death in birds. 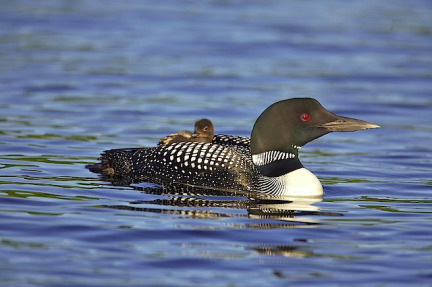 To track down where waterbirds might be exposed to the toxin, a recent study developed a model of how loon carcasses drift using an approach similar to that of search-and-rescue operations, said Jennifer Chipault, a wildlife biologist for the U.S. Geological Survey National Wildlife Health Center. The idea stems from previous evidence that loons – the most plentiful victims of avian botulism – feed as deep as 250 feet. That suggests the birds may be contracting the toxin further offshore than originally thought. The impact of the disease can be massive. For example, the carcasses of hundreds of loons that died of botulism were found at Sleeping Bear Dunes National Lakeshore in 2012. The carcass drift model provides an opportunity to focus on where toxin production is likely occurring or where it is being transferred to the birds, lead author and USGS research wildlife biologist Kevin Kenow said. Information was gathered from satellite transmitters and GPS devices attached to loon carcasses collected by the state of Minnesota, he said. Next, the model was used to backtrack the carcasses of non-radiomarked birds that died from botulism and washed ashore. It used wind, wave and current conditions to identify the paths they drifted. The gene that produces the botulism toxin is fairly widespread, but not in high concentrations, said Stephen Riley, a USGS research fishery biologist in Ann Arbor. “We had very few places where we called them hotspots, and those kind of places are where we think the birds would ultimately be getting the toxin from,” he said. One reason may be the increasing growth of cladophora, an algae native to the Great Lakes, the researchers said. The increase is due to invasive mussels, like quagga mussels, that attach to the sand and provide a hard surface for the algae to attach, Riley said. Mussels also clear the water, allowing light to penetrate more deeply. That lets the algae to grow deeper. And the mussels excrete soluble phosphorus that fertilizes the algae. The bacterium that produces the toxin requires conditions with absolutely no oxygen. The researchers say the settling and rotting of the algae may form those conditions. Storms may stir up the algae, releasing the toxin where it’s taken up by bugs scavenging in the algae. Fish eat the bugs and birds eat the fish. Kenow said that once that’s solved, addressing the problem depends on the source of toxin production or its pathways up the food chain. In Sleeping Bear Dunes National Lakeshore alone, 500 to 600 loons died from botulism in 2012. Around 300 deaths were concentrated in one week in October, Riley said. There are only 10,000 to 15,000 breeding pairs of loons in the Great Lakes states, so if that happens every year, it could become a significant cause of death. The 2012 die-off concerned the National Park Service which has been monitoring bird carcasses with the Geological Survey, said Brenda Lafrancois, a regional aquatic ecologist for the Park Service. The agencies coordinated volunteers to report or send in bird carcasses found on a section of the beach at Sleeping Bear. “Botulism is probably the single biggest killer of wild birds in the world,” Riley said. Some studies say up to a million birds a year die from it. The toxin can kill people in doses measured in nanograms, which are millionths of a gram, he said. Typically it must be ingested to kill. Chipault said the toxin also can to enter the system via the eyes or a cut in the skin. She encourages people to report dead birds on beaches to local natural resources agencies. Riley said that if loons contract the toxin in 150 feet of water, which is about 10 miles offshore, people are unlikely to encounter it swimming. The bigger danger is from poking around at a dead bird on the beach and then accidentally touching their mouths, which is improbable, he said. Dogs can get sick or die if they pick up the birds. “The fish you eat probably aren’t going to have it either, because it’s more likely to occur in the small forage fish that eat bugs rather than the game fish that are eating other fish,” Riley said. And affected fish die quickly, he said. If you catch one, it’ll be obviously sick-looking, and you’re probably not going to want to eat it. The study appeared in the Journal of Great Lakes Research. Colleen Otte writes for Great Lakes Echo. “Identifying the Origin of Waterbird Carcasses in Lake Michigan”: http://www.sciencedirect.com/science/article/pii/S0380133016300028. LANSING – In an effort to protect Michigan’s deer, the state’s Department of Natural Resources (DNR) wants to double the number of core areas monitored for deadly chronic wasting disease. This expansion would include six new townships in Eaton County and two in Clinton County.